Meet Larry. He’s just turned 40 and he’s still single. If you can get past the glow of his Grecian formula you can see his hairline beginning to make a hasty retreat from his forehead. Larry’s leisure suit is of the highest quality (100% man-made material, permanent press, too!). He wears at least 11 gold chains and his freshly-capped teeth could blind you in a bright light. Become the lovable nerd Larry for one fabulous night. You’ll drink. You’ll gamble. And, if you play your cards right, you might even meet the girl (or girls) of your dreams. This is the original version using the AGI engine. Flashback Friday: We begin a monthly series of Flashback reviews of one of Sierra's greatest legacies: Larry Laffer. Stuck in Leisure Suit Larry in the Land of the Lounge Lizards, or looking for the best way to proceed? Click below to view our walkthrough for Leisure Suit Larry in the Land of the Lounge Lizards and wonder no more! Leisure Suit Larry in the Land of the Lounge Lizards is an adventure game, released in 1987 by Sierra On-Line. 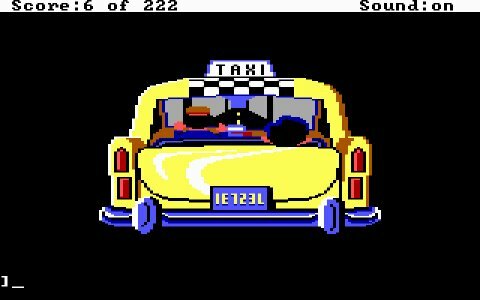 Leisure Suit Larry in the Land of the Lounge Lizards has a Illustrated realism style and uses a Keyboard, Text parser control scheme. Adventure Gamers have published a review of Leisure Suit Larry in the Land of the Lounge Lizards and rate it as Good, meanwhile the community rating for Leisure Suit Larry in the Land of the Lounge Lizards is Good.